Samsung Galaxy S8 Active User Guide and Manual PDF - Samsung release a new millitary design smartphone give you an extra safe while on outdoor with a durable metal frame, features a shatter-resistant screen. 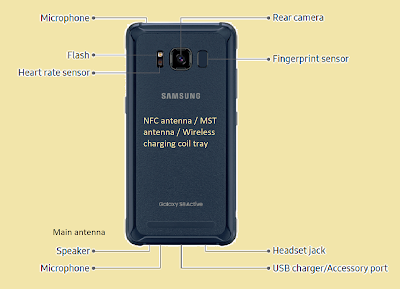 Read Galaxy S8 Active user guide, how to set up, how to settings, how to use with our tutorial and bring free user manual in pdf version by follow the download link. Galaxy S8 Active features a shatter-resistant screen. This shatter-resistant screen is up to five feet. Water-resistant up to 5 feet of water for up to 30 minutes please rinse residue and dry after wet. 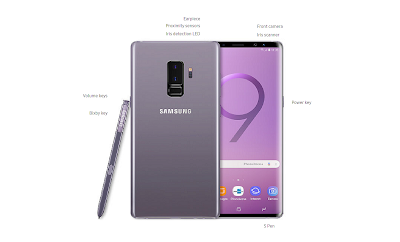 A military-grade body passed military specification (MIL-STD-810G) Samsung testing against a subset of 21 specific environmental conditions, including temperature, dust, shock/vibration, and low pressure/high altitude so don't worry to use this phone. But, it may not perform as shown in all extreme conditions so keep carefully use an electronic device. 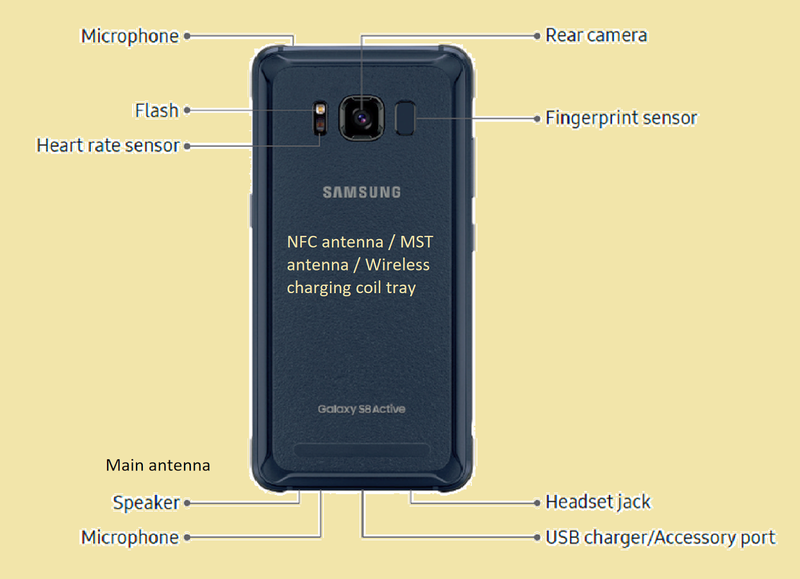 Here the Samsung Galaxy S8 Active overview, you can see the layout, buttons and hardware location. The Samsung Galaxy S8 Active illustrations you see here are for reference only. Devices and software are constantly evolving the diagram schematic illustrations you see here are for reference only. 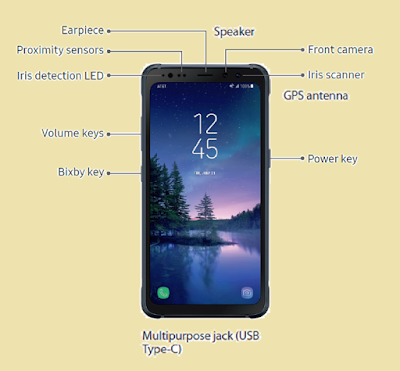 If you got a problems see the Galaxy S8 Active repair manual that support to nearest Samsung-authorized service center. If you need Galaxy S8 Active accessories pelase use from the official manufacture or using a Samsung-approved protector is recommended. Unapproved accessories may cause the sensors to malfunction. • Press to turn on or lock the screen. When you turn on the device, the soft buttons will appear at the bottom of the screen. The soft buttons are set to the Recents button, Home button, and Back button by default. Charge the battery before using it for the first time or when it has been unused for extended periods. A battery that won’t slow you down. You can power up wirelessly with a large 4,000 mAh battery. Use only Samsung-approved chargers, batteries, and cables. Unapproved chargers or cables can cause the battery to explode or damage the device. Connecting the charger improperly may cause serious damage to the device. Any damage caused by misuse is not covered by the warranty. To save energy, unplug the charger when not in use. The charger does not have a power switch, so you must unplug the charger from the electric socket when not in use to avoid wasting power. The charger should remain close to the electric socket and easily accessible while charging. The Galaxy S8 Active has a built-in fast charging feature. You can charge the battery more quickly while the device or its screen is turned off. The device has a built-in wireless charging coil. You can charge the battery using a wireless charger (sold separately). You can buy the Galaxy S8 Active on AT&T SM-G892AZDAATT for $850. Next for $28.34 for 30 months when you have eligible service. The Galaxy S8 Active from AT&T comes ready with the DIRECTV NOW app. That makes it easy for AT&T Unlimited PlusSM and AT&T Unlimited ChoiceSM customers to watch their favorite movies and shows on the brilliant, expansive 5.8-inch display for as little as $10 more a month, after a $25 a month video credit. 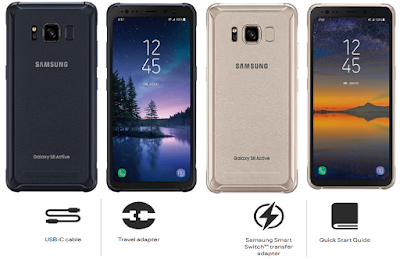 Samsung Galaxy S8 Active colors available : Meteor Gray Titanium Gold. Samsung released its Galaxy S8 Active Aug 9 2017 and go on sale Aug 11 2017. The handset is available as an exclusive via AT&T like other Active handsets before it. The Samsung Galaxy S8 Active is the latest 5G Evolution capable device, giving you a taste of the future of connectivity with our 5G Evolution technology in parts of Austin and Indianapolis, and in over 20 major metros by the end of the year. With 5G Evolution mix of spectrum and technology, and laying the foundation on our path to 5G while standards are being finalized. The manual user guide Galaxy S8 is the basics from getting started, Set Up Your Device, Assemble Your Device, Start Using Your Device to learn about your new Samsung Galaxy S8 Active. The next is How to Use Galaxy S8 Active, Settings, Apps and features, Device Maintenance, Quick Optimization, Accessibility, Troubleshooting Tips and tricks. Press and hold the Power key for a few seconds to turn on the device. When you turn on your device for the first time or after performing a data reset, follow the onscreen instructions to set up your device. To turn off the device, press and hold the Power key, and then tap Power off. The initial setup procedures may vary depending on the device’s software and your region. Follow all posted warnings and directions from authorised personnel in areas where the use of wireless devices is restricted, such as aeroplanes and hospitals. Read our next tutorials and download Samsung Galaxy S8 Active User Manual pdf here.